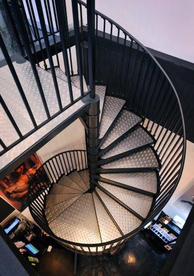 Spiral Staircases - The SpiralworksTM is Australia’s leading designer of spiral stairs of which Stairpro® is proud to be the sole agents for the supply and installation in Queensland. Spiralworks™ is the only spiral stair manufacture to have registered designs with the Australian Patents Office, testament to their engineering skills in manufacturing a unique stair and handrail system. With the introduction of our spiral stair kits, The SpiralworksTM quality and value has come to be known Australia-wide. Utilizing laser cutting technology, components are cut to exact tolerances to guarantee each stair meets with the building codes and Australian standards. The steel body ensures strength and durability. Close baluster widths, coupled with a 32mm round handrail ensures no unsightly segment joins, allowing for a smooth, free-flowing handrail. A safety gate is also available for either the top or bottom of the stairs, which is easily removed when no longer required. Our stair complies with the BCA (Building Code of Australia). Approved in all States and Territories. All steel components are finished with an oven-baked powdercoat. Choose from an exciting range of colours including our range of coloured PVC handrails to match your décor, adding value and ensuring your new stair will be a talking point. An installation service is available. For self-installation, a step-by-step brochure is provided with easy to follow instructions for a competent handyman. No welding, cutting or grinding enables our stair to be erected on any existing floor surface. The modular form of components allows for easy access into confined spaces. Stairpro® is proud to be associated with The SpiralworksTM brand. 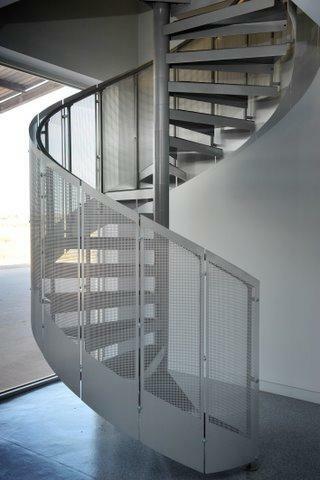 External stairs are hot dipped galvanized to ensure they last a lifetime. Each stair is custom made here in Australia to comply with all relevant building codes, site conditions and application.